Her father’s business involved importing bulbs from the Netherlands and WW1 undermined that trade. Business struggled and he sought work as manager of a seed merchant’s on the Welsh border. Just after the Armistice in 1918 he moved his family south, to Welshpool, in Montgomeryshire. In part he was attracted by the education changes David Lloyd George as Prime Minister was introducing for England and Wales. Peter’s youngest child, Eric, wrote movingly of the strangeness of flat Shropshire seen from the train windows as they neared their journey’s end. All four passed scholarship exams to Welshpool County School, where Alice studied for 3 years until she was 17, when she took Central Welsh Board senior certificate exams. In 1920 Peter remarried, taking as his second wife a Montgomeryshire woman, Martha Orr, (neé Breese), who had been living in Liverpool when she was widowed by the flu pandemic of 1918, which left her first husband, Robert, and one of their two children dead. Martha returned to Welshpool with her surviving daughter, Mildred. Peter and Martha established a poultry smallholding outside Welshpool, with Peter continuing to manage a seed merchant in nearby Oswestry and Martha running the farm. Alice, now in her later teens, hated farm life and, as soon as she finished school she moved out. Life in Britain was difficult during the 1920s, particularly after the 1929 Depression and Peter moved to Birmingham in search of better work. Alice’s older brother, Leo, born 1908, enrolled at Aberystwth University, studying agriculture and was sent on a placement to Norway. Alice visited him there, discovering a liking for travel. Eric became a journalist, training on a Welshpool paper, the County Times, then moving into national journalism in London. Their half brother, George, the older of Peter and Martha’s two sons, born in May 1923 after Alice left home, also became a journalist, but remained with local papers. Alice had reached the stage of young womanhood where she took nothing for granted. Her long yellow hair and good looks had begun to attract the attention of boys and had made her more conscious of her general appearance. Look at my hands. The skin is rough and blistered and the nails broken. I am going nursing. I can think of no better way of spending my life than by helping the sick, and there will be a chance to train and study. She looked so small and pathetic with her hair blowing in the wind and the box under her arm containing all that she possessed in the world, but I realised that her defiant spirit would carry her through any difficulties that lay ahead. Her sister, Phyllis, born 1906, followed her in to nursing, as did her stepsister Mildred, born 1909, the same year as Eric. Alice could not begin training until her 18th birthday, July 26 1923, because probationers had to live in the nurses’ homes but could not move in until they were 18. 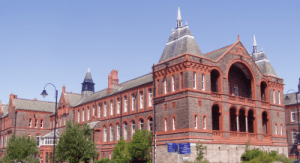 She trained at the Royal Liverpool Infirmary2 and Fazakerley Sanatorium, where she passed with distinction courses including fever and Tuberculosis nursing, sitting her last exam on her 21st birthday. Then from October 1926 to 1928 she was at Hereford General Hospital before qualifying as a Registered Nurse in December 1928. She returned to Liverpool, first to Fazakerley, where from 1930 to 1935 she was sister in charge of a surgical ward and then to the Royal Southern Hospital, a 240-bed teaching hospital in Caryl Street, where she was a pupil housekeeper. The General Nursing Council registered her as a Fever Nurse in 1926 and a Registered Nurse in December 1928. The College of Nursing on May 16 1929 placed her on its Roll3. During May 1939 I was working at the Royal Southern Hospital, Liverpool, in the housekeeping department. The sister in charge was May Dawson, who had served with QAIMNS during WW1 and she talked about war and the difficulties of war nursing, including treating typhoid patients in tents in Italy with no good water supply. Alice believed Sister Dawson, who was convinced that the Prime Minister, Neville Chamberlain was wrong in 1937 to trust Hitler and believe that the Munich Agreement had secured peace, was trying to warn Alice’s generation how hard war nursing was and how poorly paid. War was a buzz in the air and Liverpool, with its docks and shipyards, a hive of preparation. During May 1939 Alice recalled excited talk about a new submarine4, the Thetis, built by ship builders, Cammell Laird. The nurses often took evening strolls to the docks to get news. Then in June came disaster. 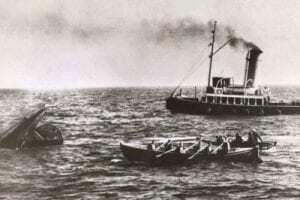 The Thetis was launched for trial dives in Liverpool Bay and gas leaks underwater killed 99 people, mostly crew and engineers on board for the trial. Nurses at the Royal Southern prepared for casualties… but only one came. Alice had volunteered for the Queen Alexandra’s Imperial Military Nursing Service (Reserve) (QAIMNS(R)) in 1938. She was an enthusiastic letter writer and kept diaries, which she stored with her qualifications certificates and photographs with a relative in Liverpool, whose family provided her with a base during training, during WW2 and later for the 18 post war years when she worked in Africa. Her memoir of WW2 tells of being on holiday in Scotland when War was declared on September 3rd. She returned to Liverpool to find her call up letter. A course she had been enrolled on was canceled and her call up was not long in arriving. She had her medical examination at the Royal Liverpool Infirmary and then went to the Queen Alexandra’s Military Hospital, Millbank, in London to get her uniform, kit and first posting. .”Butter Rollies” also known as a rowie, rollie or Aberdeen roll, is a savoury Scottish bread roll. They are noted for their flaky texture and buttery taste (hence the name), similar to a flattened, round croissant, with a very salty taste. They are often eaten toasted with jam or butter, although the high fat content makes them extremely hot when toasted.